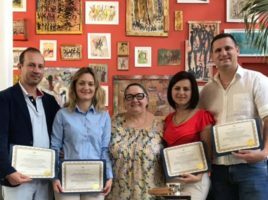 ICEA in partnership with Ukrainian Higher State Educational Institution “Banking University” had invited a group of Ukrainian educators to participate in a program that was conducted December 04 – 10, 2018 in Miami, Florida. The purpose of the program was to familiarize the Ukrainian delegation with American innovations in modern economic and educational systems. Thanks to colleagues from the Atlantic University of Palm Beach and the International University of Florida for the presentation and exclusive teaching experience.